Employment law reform; what can an employer do? Top Manufacturing and Engineering Talent 2030. Do you have specialist wallpapering skills? At this time of year lets spare a thought for the employees. With the recession threatening a double dip and government bringing in new employment laws favouring business it might seem a little bleak to the individual; but hope springs eternal and the Building Magazine good employer guide has done a fantastic job by showing who’s really leading the way. So this month Constructing Equality would like to congratulate all organisations who strive to provide a supportive, inclusive and rewarding environment for their staff we hope the newsletter will help further your aims in the New Year. Building have published their good employer guide finding Two architects Rodgers Stirk Harbour and Assael the winning firms. Followed by project managers Buro Four and the main contractor Vinci in fourth place with consultants John Rowan and partners coming in fifth. We particularly like the quick data available on each firm especially showing percentage of female non admin staff. On Nov 23rd the government announced the proposals it intends to make to employment law with the alleged aim of making life easier for business. We felt that it produced some good resources for businesses such as the Employers charter which outlines the reality behind common employment myths; Also resources and advice about resolving workplace dispute. It was also interesting to read the concerns of Sarah Veale at TUC who posted a succinct blog looking at the business case for upholding employment rights. The localism act is likely to have a variety of differing impacts; obviously for those with a focus on diversity the effects on social housing are likely to be the most prominent. This plain English guide to the localism act outlines the changes the act will introduce for those of you who don’t have the time to decipher legal jargon. We would like to extend our congratulations to Colin Orr PCIAT who became the Chartered Institute of Architectural Technologists’ 25th President on 18 November, Colin is believed to be the first black president of a built environment institution. Whilst this fact currently proves the exception not the rule we are glad to see diversity continuing to break through into industry leadership and look forward to seeing Colin prove a good role model to all industry. CIHE have therefore launched a website and are working on a report that will publish a set of recommendations for schools, universities, funding and research councils, industry, business and government in order to help the UK realise its leadership potential within engineering and manufacturing. It has been informed by research and overseen by the CIHE Task Force co-chaired by Richard Greenhalgh (Chairman, CIHE) and Professor Nigel Thrift (Vice-Chancellor, University of Warwick) with representation from industry and academia. Our fellow members of the Construction Industry Council (CIC) Diversity Panel have worked hard over the past few months in putting together last week’s event around diversity. The day involved a number of speakers and feedback sessions which brought to the fore some interesting points such as "If 60% of newly appointed managers are women, why are only 22% of senior managers women?" asked Kathy Knight, HR Director of Mace. Read more about the issues raised and the solutions put forward by the speakers and delegates. An article from the BBC reporting on a scheme to give women the chance to become electricians called wired for success. Thanks to Sarah at Harrison stringfellows Architects for the spot. BT Tower was the fabulous location for the celebration last month of a fantastic achievement. Working together leading UK employers, recruitment companies, charities, government departments and disability experts have created a community of more than 1,000 organsaitions sharing learning to develop best practice in recruitment of disabled people. Kate Headley, Development Director at The Clear Company, finished the speaches with a further rallying call by reminding everyone, what this is all about, people, disabled people looking to achieve their personal goals in their careers. "A great example is SkyBlue Carillion working with Action for Blind People to place visually impaired people into construction jobs". Candidate should send their CV’s via email to HR Director, Carole Burton for review and shortlist for interview. 10am – 1pm, They say "We support and encourage our female talent from the start, through chartership up to director level, across our range of professional services. Our pioneering women receive accolades for their work and influence in the built environment. We offer unrivalled opportunities, including the chance to work with some of the industry’s leading global experts. These are just a few of the reasons why Arup is a magnet for the world’s female engineering design and consulting talent." To find out more about being a woman at Arup, join our open day to network and hear from some of our successful female staff. WAMT member Frances Rice is looking for a tradeswoman to work alongside her on a job in Hertfordshire. You must be experienced in hanging horizontal wallpaper. For more information contact Frances on 07977 306 288. Willmott Dixon are encouraging women to apply for their multi-trade vacancies. All applicants must be able to drive and any trade discipline can apply i.e Electrician, Plumbers. heating Engineers, Joiners. Northampton, Kettering, Milton Keynes, Bishop Stortford. Email Sharon Ayles for details. • A brief summary of what the EWL programme has achieved within the construction sector which will be complemented later in the year by the knowledge pack – a fuller report on the findings and recommendations of the programme. Constructing Equality would like to extend thanks to Freda Line for all of her hard work on this programme. lesbians working in operational and skilled manual jobs as well as in professional and managerial roles in the UK construction and transport sectors. An interesting paper that looks further than the tradditional male and female gender divides in construction to see how two male homosexuals view women working in the industry. UCATT is the largest union in the construction industry, and one of WAMT’s Associate Members. They have recently been working alongside WAMT to develop a new questionnare, designed to gather information which will help UCATT improve the support it offers to female construction workers. If you're a tradeswoman, UCATT invites you to share your experiences and opinions by completing the online survey. Everyone who completes it will be in with a chance to win an Apple iPod shuffle. The Women and Work Programme is part of a £25 million government investment for the training and development of 25,000 women, across a range of industries within which women are currently under-represented. The programme is one of a variety of measures which aims to help close the gender pay gap in a generation and stimulate cultural change among employers. Fund (EIF) to build and expand on the previous phases of the programme ensuring that it can continue to March 2012. 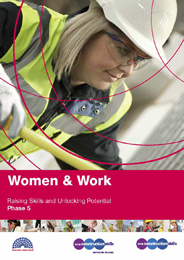 See training available on the women and work programme. The Equality and Human Rights Commission (EHRC), AbilityNet and BCS, the Chartered Institute for IT have developed the only product of its kind in the UK – the Web Accessibility Essentials e-learning course. This 80 minute, cost effective, on-line course is designed to equip individuals and businesses interested in accessibility best practice with a fundamental understanding of digital inclusion. Women in Transport Winter Reception Tuesday, 6th December From 6.30pm to 9pmSavoy Place, 2 Savoy Place, London WC2R 0BL.